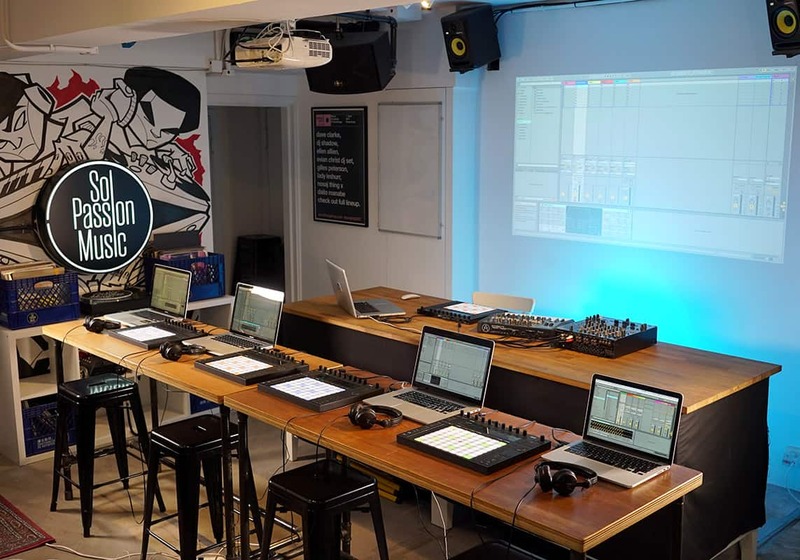 Sol Passion Music is a 2000sf multifunctional creative studio space conveniently located on Tsat Tsz Mui Road in Quarry Bay. Fully equipped with the latest technology we have 2 x sound treated Music production studios, 2 x DJ practise rooms, & a large classroom/creative space with projector & PA system for workshops, masterclasses, artist showcases, performances, corporate functions, and group activities. There are also dedicated receptionist and kitchen facilities for catering to large events, including a waiting/meeting area for students/instructors/members/visitors to relax or work on their own projects before sessions. Sol Passion Music is conveniently located on Hong Kong Island in Quarry Bay, 1 minute walk from Quarry Bay MTR Station Exit C.
Our Class Room is fully equipped with a 1080p high definition projector, long wooden high tables with chairs for up to 30 people seated + 20 people standing, dedicated presenter table with HDMI & Apple TV Airplay available, birds eye desktop camera that can be linked to the projector for demonstrations, microphones, PA sound system and a mixer for presenters. Additional equipment for classes, workshops and events are also available i.e. laptops, midi controllers, DJ equipment, synthesizers, speakers and headphones. We can also arrange catering, videography and photography for functions and events in this space. Email us at info@solpassionmusic.com with your requirements and we’ll arrange a quote for you today! 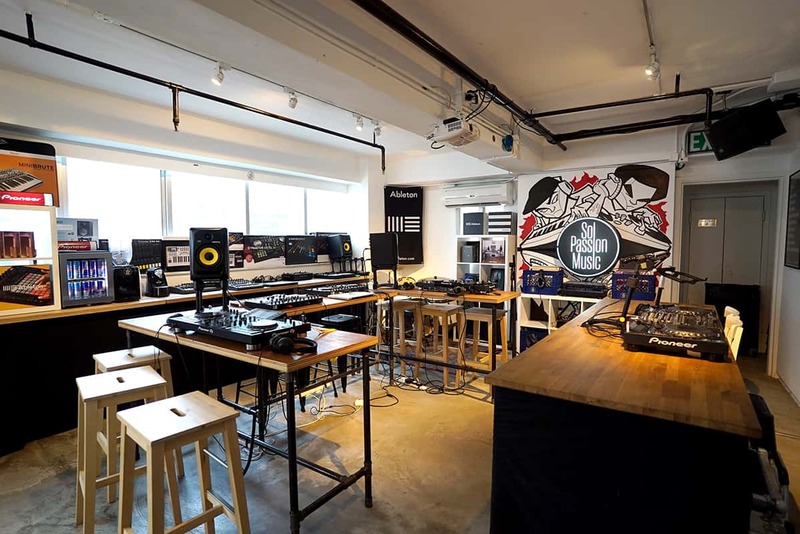 Two perfect spaces to escape the Hong Kong hustle and focus on making music. 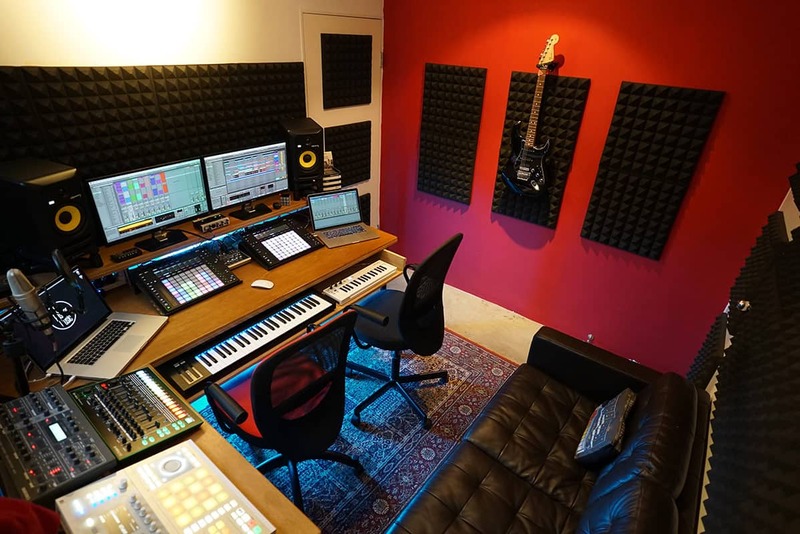 Great for sound recording and design, our music production studios are sure to get your creative juices flowing. Equipped with KRK Studio Monitors, Ableton Live, Komplete Ultimate 11, Arturia Synthesizers, Roland Drum Machines, Ableton PUSH 2, Maschine Studio + Jam, and a RØDE NT2-A microphone. If you require an audio engineer to help with mixing and mastering, the rate is 500 HKD an hour (minimum 1 hour). 2 x Fully equipped DJ Prac Rooms are readily available for practice sessions as well as audio/video podcast & radio show recordings. Record a mixtape, produce a promo video or get all the practice you want in these sound treated rooms. Pioneer CDJ 2000NXS/NX2, DJM 900NXS/NX2, Technics Turntables, Sound Treated.